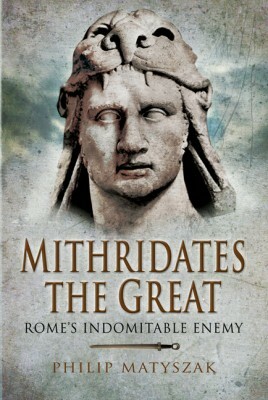 A military biography of Mithridates VI ‘the Great’ of Pontus, Rome’s most persistent enemy. The Mithridiatic wars stretched over half a century and two continents, and have a fascinating cast of pirates, rebels, turncoats and poisoners (though an unfortunate lack of heroes with untarnished motives). There are pitched battles, epic sieges, double-crosses and world-class political conniving, assassinations and general treachery. Through it all, the story is built about the dominant character of Mithridates, connoisseur of poisons, arch-schemer and strategist; resilient in defeat, savage and vindictive in victory. Almost by definition, this book will break new ground, in that nothing has been written on Mithridates for the general public for almost half a century, though scholarly journals have been adding a steady trickle of new evidence, which is drawn upon here. Few enough leaders went to war with Rome and lived long to tell the tale, but in the first half of the first century BC, Mithridates did so three times. At the high point of his career his armies swept the Romans out of Asia Minor and Greece, reversing a century of Roman expansion in the region. Even once fortune had turned against him he would not submit. Upto the day he died, a fugitive drive to suicide by the treachery of his own son, he was still planning an overland invasion of Roman itself.